The City of New Orleans is known for many things—Mardi Gras, the French Quarter, and Cajun cuisine, to name a few. This unique, diverse city located along a bend of the Mississippi River will celebrate its tri-centennial in 2018. As a tribute to this historic milestone, a new world class airport terminal was planned—the Louis Armstrong New Orleans International Airport. 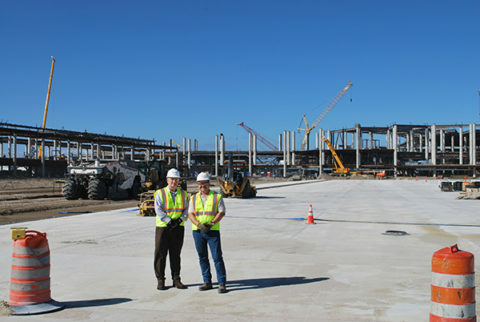 The airport is one of the critical infrastructure projects that the City of New Orleans initiated after Hurricane Katrina devastated the area in 2005. The $950 million terminal complex will include three concourses encompassing over 1,000,000 square feet of space, 35 gates, a 2,000-space parking garage, and elevated access roads. Terracon was selected by the global engineering design firm, WSP, to serve on the Quality Assurance (QA) team along with other consultants on behalf of the New Orleans Aviation Board. The new airport site, along with much of the city, is developed on very unstable soils that can be considered swamp land. To build on these subsurface conditions, significant ground improvement is necessary. Deep pile foundations were required to support buildings, as well as wick drains and surcharging to reduce settlement before construction of pavements could begin. Although Terracon’s engineers and technicians typically perform pile capacity and integrity testing on a percentage of piles in a given project, the airport project required testing on more than 7,600 piles. Ready for the challenge, the Terracon project team quickly developed a strategy to undertake this massive testing requirement. 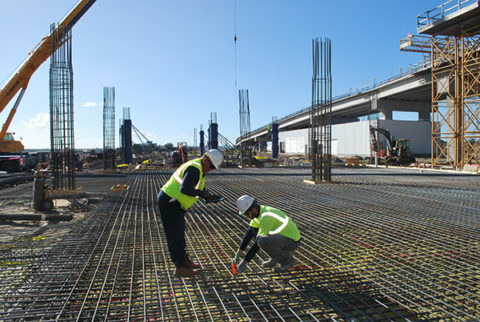 The pile monitoring program developed by the team included almost 1,000 18-inch diameter concrete piles in the elevated roadway, and more than 6,600 14-inch concrete square piles in the main terminal and concourses. Piles ranged from 95 to 110 feet in length. As the project has continued over the past two years, our scope has evolved and grown to include not only QA, but also special inspections, and building enclosure testing services for this massive project. 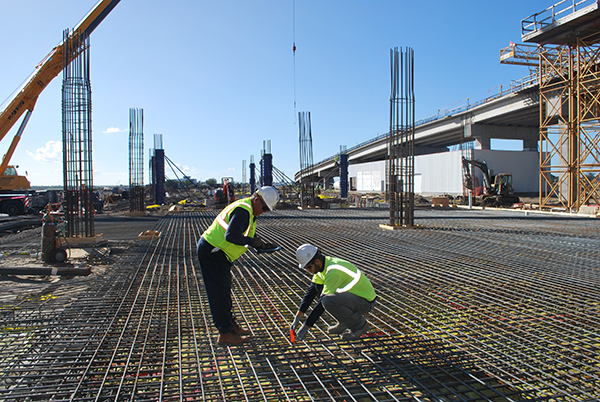 To support the project’s extensive materials inspection needs, the team provided field engineers to perform pile integrity testing on 100% of the precast piles supporting the buildings, and pile-driving analyzer (PDA) on 2% (150+ piles) of the precast piles driven for the project. We also provided special inspectors for reinforcing steel and concrete, masonry construction, structural steel connections, spray applied and intumescent fireproofing, and technicians for concrete sampling and testing. As the project progresses, more testing will be required. 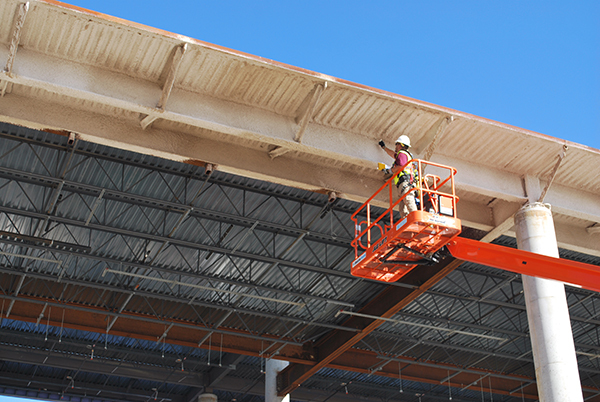 We are also performing special inspection of masonry construction for the concourses, fireproofing inspection and roofing observation for the terminal and concourses. On the site, utility installation continues with Terracon technicians performing density tests of backfill, as well as cement treatment of pavement subgrade soils. The Louis Armstrong New Orleans International Airport is currently scheduled to open in early 2019. We are proud that Terracon’s team of engineers, technicians, and partners are making a major contribution to keeping this momentous project on track for a safe, quality, and timely completion. Daren Thomas, P.E. is a principal and senior materials project manager in our New Orleans office, and has more than 30 years of experience with geotechnical and materials engineering projects. Daren serves as project manager for the New Orleans Airport project and has extensive experience with the area's challenging soil conditions. 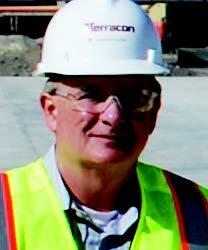 Ricky Simon serves as the project executive responsible for the overall project execution. He was involved in winning the project and in negotiating contracts and budgets. 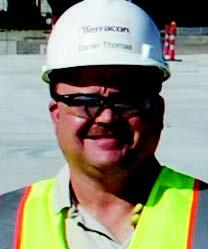 He is a senior principal with Terracon and oversees operations in Louisiana, Mississippi, and south Alabama.